7 x 10 in - 18 x 25 cm. Just had a short City break in Venice. This was the only sketch I had time to do. This is the Ponte de Paglia. 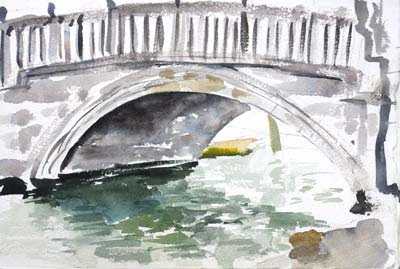 Anyone on the bridge looking our way will be looking directly at the "Bridge of Sighs". There are photos of Veince in my photo gallery follow the links on the left.